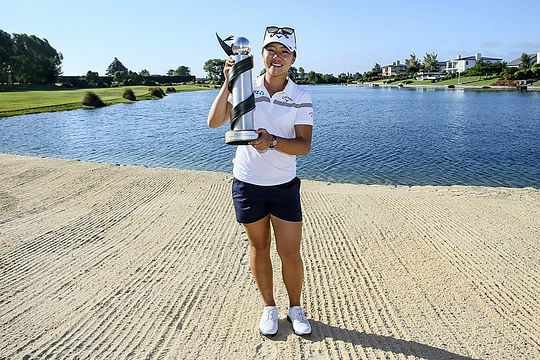 World number one Lydia Ko survived another Christchurch earthquake and the expectations of her homeland fans to successfully defend her ISPS Handa New Zealand Women’s Open title at the Clearwater Golf Club on Sunday. Just 11 minutes before Ko and partner Frenchwomen Justine Dreher were due to tee off, a magnitude 5.8 earthquake struck just 10kms from the course which had locals and international visitors alike in a panic for the 30 seconds it lasted. Over the next 5 hours there would be a total of 52 further aftershocks, with the initial quake the 9th largest in Christchurch’s history. The overnight leader by one shot, Ko managed to stave off the challenges thrown down by several players to card a 10-under par total and win by two strokes over Korean amateur Hye Jin Choi, England’s Felicity Johnson and Denmark’s Nanna Madsen at 8-under par. It was Ko‘s third New Zealand Open title, having won her maiden championship as a 15-year old. “To defend a tournament is one thing but to play well in your national Open in front of so many people here makes it extra special. It is a week to remember,” the 18-year old said. Ko was especially emotional during the prize giving ceremony, thanking NZ Golf for all they had done for her career, before pledging her €30,000.00 first place cheque to help New Zealand in some way. “I have discussed this with my family and my team and this is something that we all want to do. We will seriously think about the best way that we can use this money to help New Zealand,” Ko said. Australia’s best performed players were Whitney Hillier, Sarah Kemp and the amateur Hannah Green, who finished at 4-under par in a tie for 10th place. They were a stroke clear of a group that included Stacey Keating and Lauren Hibbert at 3-under par. A buoyant Ko will now move on to attempt to defend her ISPS Handa Women’s Australian Open title at The Grange Golf Club in Adelaide this week, an event tri-sanctioned between the ALPG, LPGA and Ladies European Tours.